Many pet owners do not realize just how different their dog’s nutritional needs are from their own. All living things require a balance of certain nutrients in our diets but, for dogs, the ratio for those nutrients is different. Dogs are not strictly carnivores in the way that cats are, but meat plays an incredibly important role in their nutrition. Before you can choose a high-quality dog food product for your adult dog, you need to know the basics about your dog’s nutritional needs. As we’ve already mentioned, meat plays an incredibly important role in your dog’s diet. Your dog is not strictly a carnivore (usually called an ‘obligate’ carnivore) like a cat is – in the wild, wolves have been known to eat plant products when meat is scarce. Even so, however, your dog’s body is biologically adapted to digesting and absorbing nutrition from animal products more than plant products. This means that, even though certain plant food contain protein, it is in a less biologically valuable form than animal proteins like meat, poultry, and fish. Animal proteins should be the foundation of any dog’s diet because it provides the amino acids needed to build and maintain healthy muscles. In addition to plenty of protein, your dog also needs a certain amount of healthy fat in his diet and this, too, should come from animal sources. While protein provides about 4 calories of energy per gram, fat provides 9 calories per gram – that makes fat a highly-concentrated source of energy for your adult dog. You need to be careful, however, because too much fat in your dog’s diet could lead to an excess of calories which could lead to unhealthy weight gain. Small-breed dogs have very fast metabolisms so they will burn through calories very quickly – fats are an essential source of energy for small dogs. Large-breed dogs, on the other hand, burn fewer calories per pound of bodyweight than smaller dogs so they need a moderate amount of fat in their diet. While protein and fat should be the primary sources of energy for your dog, carbohydrates are included in most commercial dog food recipes as well. Carbohydrates provide 4 calories of energy per gram, just like protein, but remember that animal products are more biologically valuable for dogs than plant products. Most dogs can digest whole grains and starchy vegetables, but processed grains like corn, wheat, and soy products are generally low in nutritional value and are harder for dogs to digest. Your adult dog needs at least 18% protein in his diet and at least 5% fat. When it comes to carbohydrate, however, there are no recommended minimums. You just want to make sure that the sources are high-quality and digestible and that the total fiber content doesn’t go above 5%. 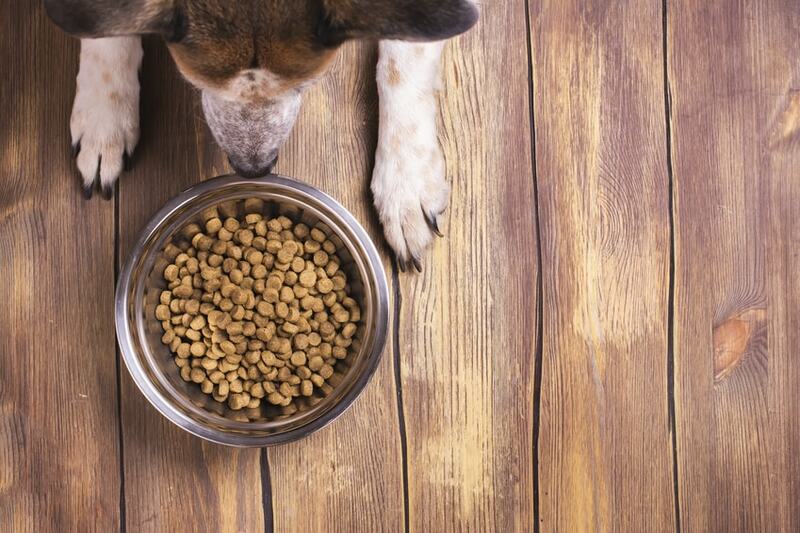 Too much fiber in your dog’s food could actually make it harder on his digestive system. When shopping for a healthy adult dog food product, there are a number of different things you need to consider. Most important, however, is the quality and type of ingredients used. Every dog food package is required to carry a list of ingredients and these are ordered in such a way that the ingredients used in the highest volume appear at the top of the list. This means that you want to see high-quality animal proteins at the top of the list with healthy animal fats and digestible carbohydrates close behind. Any product that lists a grain or grain-free carbohydrate as the first ingredient is not a good choice for your dog – dogs need a diet that is comprised primarily of protein, and quality protein at that. After you’ve ensured that the product includes at least one source of quality animal protein, you should make sure that the rest of the ingredients are of high quality as well. Animal fats like chicken fat and salmon oil are excellent sources of concentrated energy and essential fatty acids. Plant-based fats are not necessarily bad for your dog but, because they offer more limited bioavailability, they are best used as supplementary fat sources. And remember, if you have a large-breed dog (or an overweight dog), you need to limit the amount of fat in your dog’s food. The opposite is true for small-breed dogs – you don’t want to go overboard, but you should look for a product with higher fat content. When it comes to the carbohydrate content of your dog’s food, you want the ingredients to be as unprocessed and natural as possible. Corn and wheat ingredients (even if they are listed as whole grains) generally need to be processed to make them digestible for dogs and, even if your dog could digest them easily, these and other grains come with a high risk for triggering food allergies and sensitivities. If your dog isn’t grain-sensitive, whole grains like brown rice, oatmeal, and barley may be good options. If he is, however, you’ll want to stick with gluten- and grain-free options like potatoes, peas, tapioca, or sweet potatoes. You should also make sure that the recipe contains any necessary supplements to ensure complete and balanced nutrition. Chelated minerals are an excellent ingredient to see and dried fermentation products (a type of probiotic) are as well. Nature’s Variety – If you are looking for a pet food company that offers a wide variety of product choices, look no further than Nature’s Variety. An independent food company based in St. Louis, Nature’s Variety makes it their goal to empower pet parents to transform the lives of their pets with healthy foods. This company believes in the transformative power of quality nutrition and they make an effort to ensure that each product they sell is an example of that quality. Nature’s Variety offers two different product lines – Prairie and Instinct. The Prairie line features natural pet food products designed with a holistic nutritional philosophy and made with simple ingredients like fresh meat, whole grains, and fresh fruits and veggies. Nature’s Variety Prairie offers four flavors of dry food and seven canned food recipes. When it comes to the Instinct line of products, however, there is a large variety of recipes to choose from. For adult dogs, you will find an assortment of traditional kibbles, high-protein kibbles, freeze-dried meals, raw food products, and limited ingredient diets. Acana – The Acana pet food brand is known for producing “biologically appropriate diets” made from fresh, regional ingredients and prepared in award-winning, company-owned kitchens. Acana believes in creating products that mimic the natural evolutionary diet of cats and dogs which incorporates “whole prey” meat ratios which include fresh meats, organ meats, and raw bone. These ingredients are naturally rich in essential vitamins and minerals which limits the need for synthetic supplementation in Acana pet food products. When it comes to Acana dog food, there are three product lines to choose from (as well as a line of single-protein treats). The Acana Heritage line includes three different recipes that are rich in animal protein, low in carbohydrate, and full of natural flavor – these recipes contain at least 60% poultry, fish, and meat ingredients. The Acana Regionals line includes four recipes featuring fresh, regional ingredients sourced from Kentucky, the same state where these products are made. Finally, the Acana Singles line includes four limited ingredient diets which feature 50% duck, pork, lamb, or mackerel with gluten- and grain-free carbohydrate supplementation. Holistic Select – As the name of this company implies, Holistic Select follows a holistic approach to pet nutrition. This company believes that natural, healthy pet food products are the key to longevity and total body health and wellness in pets – that is why they use only the highest quality ingredients like healthy animal proteins, whole grains, omega fatty acids, and fresh fruits and vegetables. All of Holistic Select’s products also include the Unique Digestive Health Support System which includes a proprietary blend of superfood ingredients with antioxidant, probiotic, and holistic health benefits. When it comes to their dog food recipes, Holistic Select offers over a dozen different dry food products and half a dozen canned foods, plus several treats. Holistic Select dry dog foods come in both original and grain-free recipes featuring premium proteins like duck, chicken, lamb, and salmon as well as digestible carbohydrates including whole grains, beans, and legumes. In addition to traditional adult dog food recipes, Holistic Select also offers several breed size-specific formulas for small and mini breeds as well as large and giant breeds. There is also a formula for adult dog weight management. Taste of the Wild – The Taste of the Wild brand is not one that you will find in every pet store, but it is one of the top brands of premium pet food on the market. This brand produces only grain-free recipes made with premium-quality ingredients that are marketed as, “the balanced diet that nature intended”. All of Taste of the Wild’s products are made with real roasted meats with fresh fruits, vegetables, and legumes for carbohydrate support. Furthermore, each recipe is an excellent source of digestible energy and antioxidants to support your dog’s immune system. In terms of their product offerings, Taste of the Wild only has a total of nine dry food recipes, two of which are puppy-specific – there is also one small-breed specific recipe. Each formula is supplemented with K9 strain probiotics and prebiotic fibers to support your dog’s healthy and regular digestion, plus a blend of omega fatty acids for healthy skin and coat. In addition to meeting your dog’s need for protein-rich nutrition, each Taste of the Wild formula is also packed with the kind of natural flavor your dog craves. Merrick – The Merrick pet food company follows the tagline, “whole health made right” which speaks to their nutritional philosophy which is founded on whole-food ingredients. Merrick offers a wide variety of hand-crafted, all-natural pet food recipes made with the freshest ingredients available and formulated for dogs in all life stages, of all breed sizes, and with different nutritional needs. Merrick has been and remains a family-owned company with a passion for making the best pet food ever. When it comes to their dog foods, Merrick’s products can be divided into five different lines. The Classic line includes traditional kibbles and canned foods made with real meat, fish, or poultry as the #1 ingredient and supplemented with ancient grains for maximum digestibility. The Limited Ingredient Diet line is developed with limited ingredient lists, specifically for dogs with food allergies or sensitivities. The Backcountry line is actually split into grain-free, high-protein kibbles and grain-free, freeze-dried raw recipes. Finally, the Grain-Free line includes an assortment of protein-rich, grain-free kibbles and canned food products for dogs. These are just a few of the many high-quality dog food brands on the market. If you aren’t sure where to start when shopping for an adult dog diet, any of these brands would be a good place to begin. Just make sure that you choose a recipe formulated for adult dogs – you may also want to consider a breed size-specific recipe if you have a small-breed or large-breed dog.